As expected, S&P's downgrade of the United States is resulting in further downgrades. S&P downgraded both Fannie Mae and Freddie Mac quoting their reliance on the government. If anything can be gleamed from a political position it is this reasoning. Because the U.S. government -- through lenders including Washington-based Fannie Mae, Freddie Mac of McLean, Virginia, and the Federal Home Loan Banks -- is the country’s central source of mortgage funding, the downgrade could lead to higher borrowing costs for homebuyers. As we've noted many times the real crisis is the destruction of the United States middle class. It is a jobs crisis. While we doubted the U.S. economy would slide into a second recession, we noted that one could not have a major adverse event. It could be S&P running amok with so much power is that event. Because the budget deal is putting it all on the backs of the U.S. middle class, discretionary spending, this directly affects, negatively, GDP growth. EPI also has done an analysis on the current budget cuts and shows the effects are, in terms of jobs. Moody's Economist Mark Zandi also has run GDP multipliers and concludes the latest budget deal will reduce GDP by 1%. Like all great economies, when one moves to financialization, complete with bail outs and lobbyists, instead of a production economy and then gets a series of crazies out to destroy social safety nets and the U.S. middle class along with it, these are the results. So, is a double-dip recession possible now? Yes, and it's all completely manufactured by the forces above, and the pain and suffering is unnecessary. Calculated Risk has a chart of the top 1 day percentage changes in the markets and notes the infamous analogy on today's percentage. That ain't no lie and after all, isn't 2012 supposed to be the end of the world? Such a great title, putting 666 plus S&P in the same headline. Anyway, today's slaughter is one of the worst on record. Check out the link. He went heavy into the stock market two weeks ago before this crash hit. He's been buying on the way down. He has publicly said the US will not enter a recession and the stock market is a safe long run bet. He owns substantial positions in Wells Fargo and in Moody's, which means he took a big hit today because the banking sector was one of the worst performers, and he has to justify Moody's decision to maintain the Aaa rating at a time when all the publicity is on S&P, their arch rival. He was a prime beneficiary of the 2008 bailout, being given a private first look at all the assets for sale, so he is very closely identified with the authorities who are not looking too good at the moment. Despite calling derivatives time bombs ready to go off, he has a massive derivatives portfolio that just caused him to be downgraded today by S&P, so he has now lost his precious AAA rating. I would rate him very unhappy with S&P and someone with an ax to grind. In fact, from what I read in Wall Street publications, people are realizing that he never speaks publicly without an agenda and an understanding that he can move markets. The interesting thing is, as people get to understand his motives better, his ability to move markets is waning considerably. Anyway, thanks to Numerian for the report, but maybe we could give the Wiz a break! It's tough when you hit your eighties and still have to work. Shouldn't he be allowed his retirement years ... in Australia, or anywhere but Omaha? All these S&P moves represent an agenda too. It depends on what you think an S&P or a Moody's rating is supposed to mean. It's like when the average person is below the poverty line, what does that mean? So maybe there's no paper out there that should get a AAA anymore. Okay. But isn't that like an agenda respecting precious metals markets? Somebody's doing okay off the S&P announcements and some people probably knew in advance? Somebody has as much cash but more gold today than they had yesterday? "I don't think it matters much to Berkshire and I don't think it makes much sense," says Steve Check. Well, you know, the big insurers, the re-insurers, the law of averages ... yeah, it makes sense that they're going to be making more payouts more sooner as socio-economic stability declines globally, assuming that's what is happening ... and assuming it's markedly more so since Boehner walked out of the White House on a late Friday. So S&P downgrading the insurance business makes some sense. On the other hand, it also can make sense in terms of somebody's day-to-day trading profits, like over the last few days. Maybe even somebody other than the Wiz. A few days back, I opined here at EP that the NYSE is almost like an adjunct to the precious metals and currency markets. So, for Buffet, the arch-fundamentalist, the question now is "How fundamental can it get?" There is no contradiction between Buffet's buying and a reversal of the already started 'correction'. The market can go way up while we suffer much more. Captialism in its brutal, degrading, decrepit form in this time is all about pain and the blood sport. Every manager in this economy manages 'costs' - a euphemism for the bread going into our mouths. Every manager knows he gets richer not in spite of our poverty, but because of our increasing poverty. If I am wrong, I am not where I am. In an IT concentration camp, overseen by the Kommandants right out of Schindler's List, just waiting to take another shot. There are a lot of trading/financial sites publishing "fast analysis" on what the hell just happened. Frankly, I don't know. If I find out something that isn't elsewhere I'm write. For now, I'm wondering about automated, flash trades cascading on levels. Something like 73% of all trades are flash, or automated, operating from software, and trading on levels, triggers. I don't see how the Fed can basically announce, guess what, we've got a 6 year recession and have the stock market take off like a rocket. Treasuries also imploded an the entire VIX jumped 120%. There's the never-ending swinging from fear to greed and back to fear and so on. In between greed and fear, there's the wide open range of UNCERTAINTY. The Uncertainty Industry in Las Vegas and Macau seemed to be doing just fine even as New York and Hong Kong markets tanked. In an interview following a conference call with analysts and investors, MGM Resorts Chairman and Chief Executive Officer Jim Murren, said he didn't believe stock market turmoil would affect continued visitation to Las Vegas. "From what we've seen, the trends are still solid and improving," Murren said. "The foundation of the Las Vegas recovery is solid and our business is building. ... "
MGM Resorts' new ownership stake in the MGM Grand Macau allowed the company to report greater financial details about the 600-room hotel casino it has operated since December 2007. ... The property collected revenues of $668 million in the quarter, compared with $307 million in the same quarter a year ago. ... Cash flow at the MGM Grand Macau grew 177 percent. Seems like we've heard the phrase "casino capitalism" lately. Go figure. What a yo-yo but which direction it will finally take is seemingly anyone's guess. 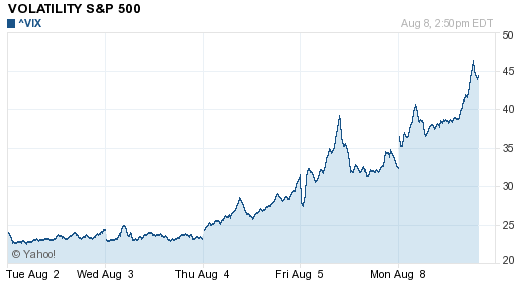 I'm fairly certain delusions of QE3 are affecting markets. People are cashing out in the short term to nail down whatever gains they can. We should tax this sort of behavior in inverse proportion to the time shares are held, to encourage buy-and-hold investing, which would encourage more research into the companies' fundamentals and less computer investobot casino monopoly. Of course Wall Street lobbyists will squish it like a bug, but we really need a transaction tax on some of this. I've wanted a small transaction tax on flash trades for some time. But our government is insane and corrupt. DJIA dropped 350 points, triggering a mandated trading halt for the first time that closed the market at 2:35 pm for a half hour. Trading resumed at 3:05 pm and the DJIA declined an additional 200 points, causing another halt at 3:30 pm that ended trading for the day. Weird how gold fever is so intense that gold today is fetching more than platinum. So nothing is certain, maybe not even gold (scarey thought). How do flash trade computer systems (programs) handle that kind of input? Of course, we'll never know. The code isn't exactly widely published. On the NYSE, has trading been halted this week? ... yet? Any circuit breakers been triggered? Yes, thousands! Short-sale rules that went into effect Feb. 28 triggered circuit breakers about 2,700 times today [August 8, 2011], according to data compiled by Bloomberg. The curbs, which began Feb. 28, limit bearish bets the day they’re triggered and the next, requiring traders to execute orders at prices higher than the best available bid. Circuit breakers for stocks in the S&P 500 and Russell 1000 Index and almost 350 exchange-traded funds, introduced after the so-called flash crash, were extended today to all exchange-listed securities excluding options. While the current curbs halt trading when shares decline 10 percent within 5 minutes, 30 percent plunges trigger the circuit breakers for securities $1 or higher that weren’t previously covered by the restriction. Stocks less than $1 trigger the curbs when they drop 50 percent in 5 minutes. Exchanges canceled trades on May 6, 2010, that were 60 percent or more away from their price at 2:40 p.m. in New York, when the sell-off intensified. Transactions in 326 securities, 70 percent of which were ETFs, were broken, regulators said. The rout that erased about $780 billion from U.S. share values Aug. 5 also reflected orderly selling by institutional investors, unlike the crash of May 2010, traders said. The S&P 500 fell 4.8 percent to an eight-month low Aug. 5, the biggest drop since February 2009. Equity derivatives suggest a level of concern similar to March 2009, when the S&P 500 fell to a 12 year low. 5% down, back up, 5% down again, 5% down again, 5% down again, 5% down again, 5% down again, and as far as FAUX or MSM tells the public ... it's all just normal trading activity. What, a stock market crash? Nah! That's like saying the Great Depression of the 1930s was caused by anything but the New Deal! Any effects you may be experiencing in your life on Main Street -- that's just because of over-regulation. And don't worry about that. Tea Party politicians will save us! But, really, shouldn't equity shares be tied to realistic expectation of earnings and shouldn't earnings reflect what it costs us here in the U.S. to buy food and gasoline, medical care and college educations? Well, if you live and work and invest in the U.S.A. and you're not one of the MNIs (multinational individuals) .... and that means you're forever dollar-denominated .... then even if your NYSE ETFs go up, you may only be keeping your head above water .... barely. I'm not predicting a second Great Depression or a series of 5% drops in ETFs -- or anything else. And I'm not saying that flash trading or NYSE circuit breakers are good, bad or indifferent. Just reporting and commenting about how NYSE and such markets apparently are functioning these days. I think the computers have had their circuits blown, after all it's something like 73% of all trades are automated flash trades. Bottom line, the stock market's huge pop up today doesn't make a lot of sense, given yesterday's claim it was about France, SoGen crashing rumor, sovereign debt, Europe and U.S. Macro economics. well, well, what a different a few 10ths of a percent make? Come on man, this is not good.